Hey guys. Is it possible to draw 3D objects in Pythonista? I know it doesn't have 3D libraries, but AFAIK Doom was made in DOS without 3D libraries (2.5 D or something). Is it possible to do such stuff in Pythonista (and if it is, what's the estimated speed?). Thanks. The drawing was reasonably fast, though this was for a pretty small level. If you can draw 2D you can always do 3D drawing. Unless you mean 3D printing 3D drawing is done by projecting the 3D onto 2D and drawing the result. After all computer/cell phones only have 2D screens. That being said there is a lot of math involved and it is nice to be able to use a library to handle it for you. Now that NumPy has been ported it shouldn't be hard to port one of the 3D graphics packages. Additional note: What is hard in 3D graphics isn't the geometry, it is rendering, i.e. coloring the surfaces. Dooms biggest trick was to require all objects/walls to be perpendicular to the viewer. That simplified the rendering requirements substantially. Essentially every object in doom was a 2D shape with an image drawn on it. You scale to represent distance. Are there any 3D libraries out there that could be made to work with numpy/PIL? Note: You can use gestures (pan/pinch) to control the camera. Is this some 2.7 -> 3.5 issue? What is the extraneous 'b in the error message referring to? But I know nothing more. Try adding load_framework('SceneKit') before the line with the error. Thanks Omz . I tried also the basic code from following tutorial using your template and it is working fine. @omz thanks, it works now, that's awesome. 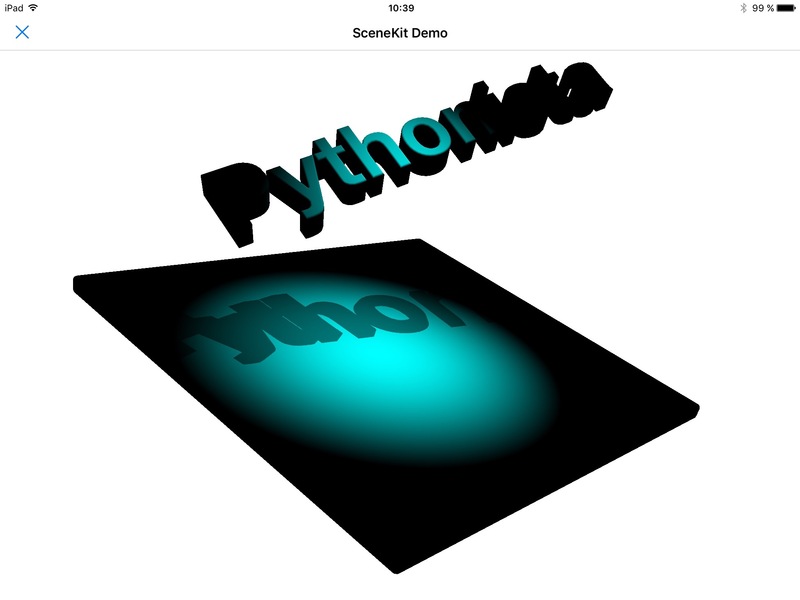 I've used SceneKit quite a lot with Swift, but I'm still new to Python/ Pythonista. One question, how come you implement SCNVector3 as a Python class, rather than importing it with the other ObjC classes? Just trying to understand the implications of working with ObjC libraries in Pythonista. thanks. SCNVector3 is a C struct, not an Objective-C class. Objective-C classes carry lots of information at runtime (their name, superclass, protocols, methods, etc. ), and all Objective-C objects contain a pointer to their class. All of this information can be looked up via APIs provided by the Objective-C runtime library. That's what makes objc_util possible. C structs, on the other hand, carry no runtime info at all. If you look at some struct data, you cannot see what its type is. For all you know, it might not even be a struct. It could also be an int, or an array of bytes. There is also no way to see what struct types there are, or what fields a certain struct type has. So to be able to work with struct data, you first need to describe its type. In ctypes, you do that by creating a subclass of the ctypes.Structure class. Your subclass's _fields_ attribute lists the name and type of every field in the struct. Once you've done that, you can allocate instances of your struct in memory, and you can tell ctypes that a function takes or returns struct data of that type. In this specific case, I don't think the declaration of SCNVector3 is actually needed. In the above code, you can see that all places where a SCNVector3 would be used in Swift, the Python/objc_util version simply uses a tuple. This is only possible because Objective-C is involved. All Objective-C methods have a type signature, which describes the types of their return value and all arguments, including structs. This allows objc_util to get some basic info about a method's struct arguments, which is enough to convert a Python tuple into correctly formated C struct data. This only works with Objective-C method arguments though, and not anywhere else. For plain C functions and variables, you still need to declare the struct type by hand. Thank you for your answer @dgelessus , really interesting. What are the step by steps to do this kind of thing ? I got, from a swift project, some SceneKit assets (files with ‘.scn’ extension). I put them in a ###.scnassets directory and try to load them using the SCNScene.sceneNamed_ method. This call fails, i got None as result. Do you know if I need to make a kind of initialization for the SceneKit resources mechanism ?